In learning how to serve wine, learning how to open a wine bottle is obviously one of the first steps! Imagine the embarrassment if you have all your guests gathered and you fumble with the corkscrew! But don't let that stress you, opening a wine bottle is easy with just about any wine opener as long as you know the basics. One or two practice tries will help as well. Here we will prime you on the steps to open a wine bottle and how to use all the basic types of wine openers so that you can pull those corks like a pro no matter what you are handed! For more information on the pros and cons of the various types of wine openers, see our Wine Opener page! First of all, you need a wine bottle and some sort of wine opener, obviously. The next general step to open a wine bottle is to cut off the foil capsule which is found on most wine bottles. The entire capsule can be pulled off or cut and removed. However, for show and elegance, it is considered more proper to cut the foil at the top, simply removing the top and leaving the rest of the capsule to decorate the neck of the bottle. 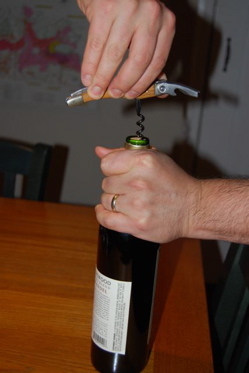 This step can be done several ways, generally with a knife which is included on the end of a corkscrew. Alternatively, some wine openers come with a foil cutter which sits atop the wine bottle and you squeeze and twist to cut the capsule. Next, you remove the cork. See below for instructions on how to use the various types of wine openers to open a wine bottle. Following removing the cork, it has been traditional to wipe the top of the bottle with a clean towel prior to pouring. This is done for two reasons. For one, it wipes free any lead which is on the bottle from the lead capsule. This reason is largely moot at this point as no capsules are made of lead anymore. However, for very old bottles of wine this may be a concern. The other reason is that there may be some mold or wine sediment/gunk that is left on the lip of the bottle after you open a wine bottle. This helps remove any material here so that it is not poured into anyone's glass. Beyond that, after you open a wine bottle its simply time to drink the wine! Read on for detailed instructions on how to open a wine bottle with various types of wine openers. 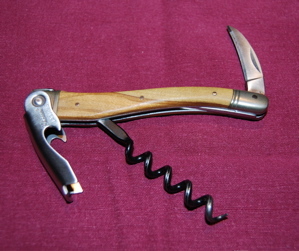 Waiter's Corkscrew - A Waiter's corkscrew is the basic corkscrew that folds down and can easily be carried in your pocket. It is standard equipment for restaurant servers, sommeliers and fine wine purists. 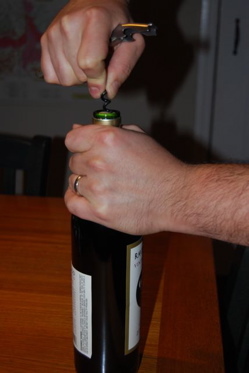 With a little practice it is a fast and convenient way to open a wine bottle. First remove the foil capsule on the top of the bottle, if there is one. This can be done with a knife. 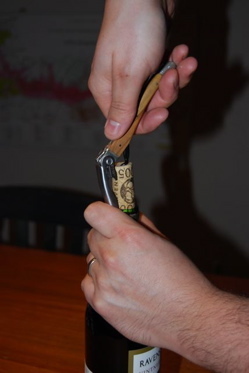 Traditionally, the small blade on the end of the Waiter's Corkscrew is used to slice around the edge of the top of the bottle to cut the capsule circumferentially. It can them be pried off easily. After closing the knife blade, extend the lever and corkscrew (worm). Next, with the bottle sitting on a table or held firmly in your left hand (assuming you are right handed) push the tip of the worm into roughly the middle of the cork. With slight downward pressure, begin twisting the corkscrew in your left hand to get the worm to start twisting into the cork. Once started, straighten it out so that the worm is parallel to the neck of the wine bottle and continue twisting until the worm is deep in the cork, practically up to where the twists of the corkscrew stop, depending on the length of your worm. Next, pivot the handle (body) of the Waiter's corkscrew up so that the metal lever end points down toward the wine bottle. There should be a lip or ledge of the metal piece which is meant to sit atop the top of the bottle. With this metal piece now firmly perched on the top of your bottle, your corkscrew is in depressed position to act like a lever to start pulling the cork out. 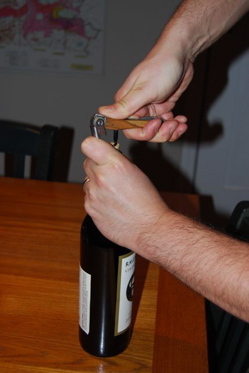 While holding the neck of the bottle and the metal part with your left hand, use your right hand to pry up the other free end of the corkscrew (the end with the foil cutter knife on it). 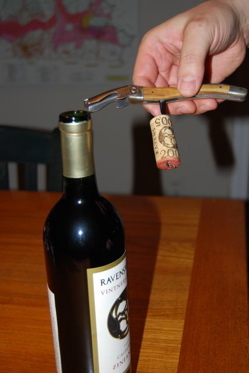 As you do this, the cork should start to rise out of the neck of the bottle. As you get to the top, if the cork is not close to totally out yet, you may need to lower the corkscrew, screw it in a bit further and then repeat the steps to pry out more of the cork. 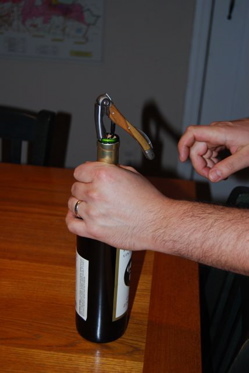 Once the cork is close to out, simply grab the whole thing, cork and corkscrew, with your right hand and pull it free. Your bottle is now open. All that remains is to twist the cork off the corkscrew worm. Ah-so - The ah-so is a handle with two metal prongs attached. It is an easy and quick device to open a wine bottle. They are particularly handy for very old corks which have a tendency to crumble if you try to use a corkscrew. After removing the capsule, place the bottle on a table or firmly in your left hand. Next, push the longer blade of the ah-so between the cork and bottle such that the other blade will come down on the other side of the cork. Continue pushing down, with a slight wiggle and pivoting if necessary, until the handle is flush with the top of the bottle. 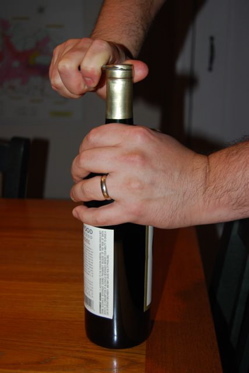 Now hold the bottle firmly with the left hand while prying the cork free with the right using the handle of the ah-so. Pull firmly and steadily and it should come free. If you are having difficulty, twist and wiggle the ah-so a bit to break the seal and get the cork moving. This process can be quick easy with soft corks and very hard with firm, large corks. With enough tugging and wiggling you should be able to slowly inch the cork all the way out. Simply pull the cork out from the prongs of the ah-so. Butterfly (Winged) Corkscrew - These are the standard corkscrews you see very frequently. A straightforward and simple way to open a wine bottle. After removing the foil capsule, place the wine bottle on a flat surface. With the "wings" (levers) of the corkscrew down and closed (which protrudes the corkscrew worm) push the tip of the worm into the middle of the cork. 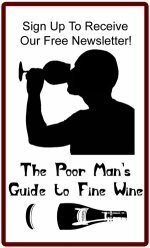 With steady downward pressure begin to twist the handle so that the worm screws into the cork as you hold the corkscrew in place with your left hand. As you screw it down, the two "wings" will slowly rise up. When the worm is screwed all the way down so that it will not turn anymore, grab both "wings" and pull them down which will lever the cork out. If only a small amount of the cork remains in the neck of the bottle, you can simply grasp the whole thing and pull the rest of the cork out. If the cork is long and still firmly in the bottle, you can usually screw the worm a bit further into the cork, followed by pushing the "wings" down again to pull the cork out further. Through this process you should be able to get the cork out completely. Simply lower the wings again to protrude the cork so that you can twist it off the worm. Standard Screwpull® - This is the smaller Screwpull model with the long teflon coated worm and a plastic cage which sits on the top of the wine bottle. Occasionally, you will come upon a bottle with "flanged" top, with a wider than normal lip at the top of the bottle. 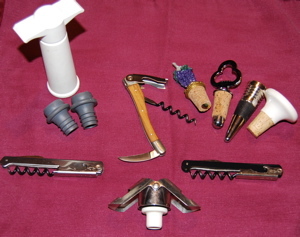 These standard screwpulls will not fit on some of these and therefore cannot be used to open a wine bottle such as this. To open a wine bottle, take the plastic "cage" of the screwpull and place it over top of the bottle until it sits snuggly. Now put the long worm through the hole on top, directed down towards the cork. Push the worm up against the cork and, with steady pressure, twist the worm with the handle while holding the bottle in place. As the worm engages the cork, simply continue twisting. Once the handle contacts the cage at the top, twisting will start pulling the cork up out of the bottle. Continue gently twisting until the cork comes out completely. Simply hold on to the cork and twist in the opposite direction to remove the cork from the worm. In the rare instance that the cork is too long and will not come out completely, simply hold on and gently pull the remainder out. Screwpull Lever Model (The Rabbit) - These are super easy to use and open a wine bottle about as fast as can be. They are big and clumsy though so they are not as convenient to carry around as a Waiter's corkscrew. After removing the foil capsule on the bottle, extend the top lever of the screwpull completely, so that the worm is not protruding at the bottom. Setting the base where the screw comes out on the top of the bottle, grip the top of the bottle with the two handles together in one hand. Now simply pull the top lever all the way down in one smooth motion until it cannot go any further. Next, reverse the movement, simply pushing the lever back up to its starting extended position. The cork will be penetrated with the downward movement and extracted with the upward movement. 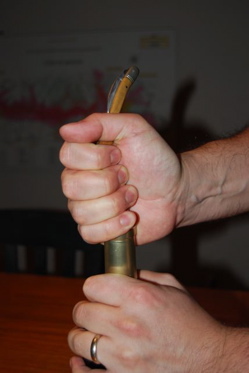 Simply release your grip with the handles and you are done! To remove the cork from the worm, pull the lever back down to the lower position, grasp the handles together tightly to hold the cork, and then pull the lever back up to the starting open position. This will pull the worm out of the cork so that your screwpull is ready for the next bottle. Cork Pops (CO2 Injector) - This device requires carbon dioxide cartridges which inject pressurized gas into the space below the cork and push the cork out from within. After removing the foil capsule, place the wine bottle on a stable surface. Put the Cork Pops device over the top of the bottle so that the needle pushes into the top of the cork. Push the whole device down firmly, piercing the cork with the needle. Continue pushing until completely engaged and flush. If you can see within the bottle neck, the tip of the needle should be through the inside end of the cork. Push the button or carbon dioxide cartridge to discharge pressurized CO2 into the bottle. The cork will slowly rise up. When out or just before coming out, stop the flow of gas. Simply lift off the cork and pull it off the needle. Tabletop or Bar Lever Corkscrew - Often installed in bars, there are also versions of this fancy lever-action corkscrew that can be mounted on a table-top frame or on the side of a bar. Similar to the Screwpull lever openers but even bigger and less portable. 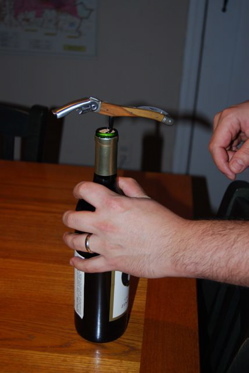 A fancy, but often impractical way to open a wine bottle. These work similar to the Screwpull lever openers, however there is one key difference. Generally, with the top lever in the up position, you start out by removing the foil capsule and griping the top of the bottle with the handles. Now simple repeat the movement in reverse to release the cork. So that is how to open a wine bottle! I hope it was clear. 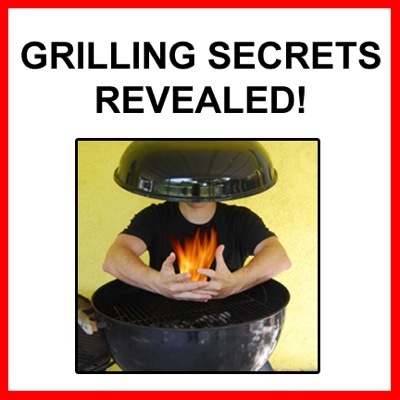 Check back often as we will be adding videos and more photos to demonstrate each process! For more information on the pros and cons of each type of wine opener, see our Wine Opener page, part of our Wine Accessories section. Done learning how to Open a Wine Bottle?